For the first time, researchers have found that the blood vessels in face transplant recipients reorganize themselves, leading to an understanding of the biologic changes that happen after full face transplantation. The results of this study were presented at the annual meeting of the Radiological Society of North America (RSNA). Face transplantation is a recent development in reconstructive surgery for patients who have lost some or all of their face from injury or disease. The first full face transplantation in the United States was carried out at Brigham and Women's Hospital in Boston in 2011. Hospital specialists subsequently performed full face transplantations on three additional patients. As part of the procedure, surgeons connect the patient's major arteries and veins to those from a donor face, or facial allograft, to ensure healthy circulation in the transplanted tissue. Because the technology is new, not much is known about the vascular changes that help blood penetrate, or perfuse, into the transplanted tissue. 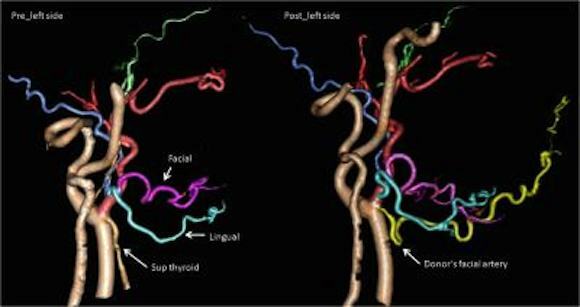 The development of new blood vessel networks in transplanted tissue is critical to the success of face transplant surgery. "All three patients included in this study at Brigham and Women's maintain excellent perfusion, or blood flow, the key element of viability of the facial tissues and the restoration of form and function to those individuals who otherwise had no face," said study co-author Frank J. Rybicki, M.D., Ph.D., FAHA, FACR, director of the hospital's Applied Imaging Science Laboratory. "We assumed that the arterial blood supply and venous blood return was simply from the connections of the arteries and the veins at the time of the surgery." To learn more, Dr. Rybicki and Kanako K. Kumamaru, M.D., Ph.D., research fellow at Brigham and Women's Applied Imaging Science Laboratory, used 320-detector row dynamic computed tomography angiography (CTA) to study the facial allografts of the three patients one year after successful transplantation. The CTA technology offers imaging over 16 centimeters of coverage, enabling the researchers to view collateralization, a process in which the body stimulates existing blood vessels to elongate, widen and form new connections. 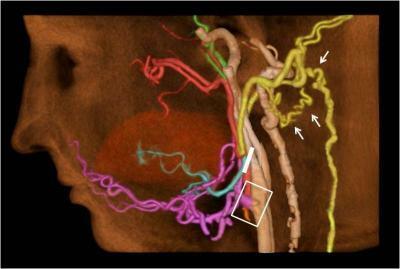 Collateralization often results from anastomoses, or branches formed between adjacent blood vessels. blood flow from collateral vessels (arrows). "The key finding of this study is that, after full face transplantation, there is a consistent, extensive vascular reorganization that works in concert with the larger vessels that are connected at the time of surgery," Dr. Kumamaru said. "We have found that since the vessels more commonly associated with the back of the head are critical to maintain the perfusion via vascular reorganization, it is essential to visualize these vessels and determine that they are normal pre-operatively," Dr. Kumamaru said. 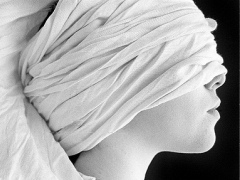 "Patients under consideration for face transplantation have universally had some catastrophic defect or injury." "Our findings support the simplified anastomosis for full face transplant procedure that, in turn, can potentially shorten the operative time and reduce procedure-associated complications," Dr. Rybicki said.